I’ve been struggling with my ph0tography a bit lately. Partly I haven’t had the time, but mostly I think I’m just disappointed in the weather. It’s still snowing almost weekly here in Iowa as we approach the first of April. I’d scheduled a vacation for Holy Week think I would get pictures of budding flowers and trees. Instead I have brown, and I’m tired of brown. But the other morning I forced myself to get out and exercise my skills at something, anything, so I went to a colorful bridge I knew of out in the country. I was so uninspired (and cold!) that I only got a couple dozen snaps off before I called it a day. There’s nothing terribly exciting in it, nothing that’s going to make you look at the world in a new way, but here’s the fruits of my minimal labor anyway. Windy Bridge by Anthony Bopp is licensed under a Creative Commons Attribution-NoDerivs 3.0 Unported License. 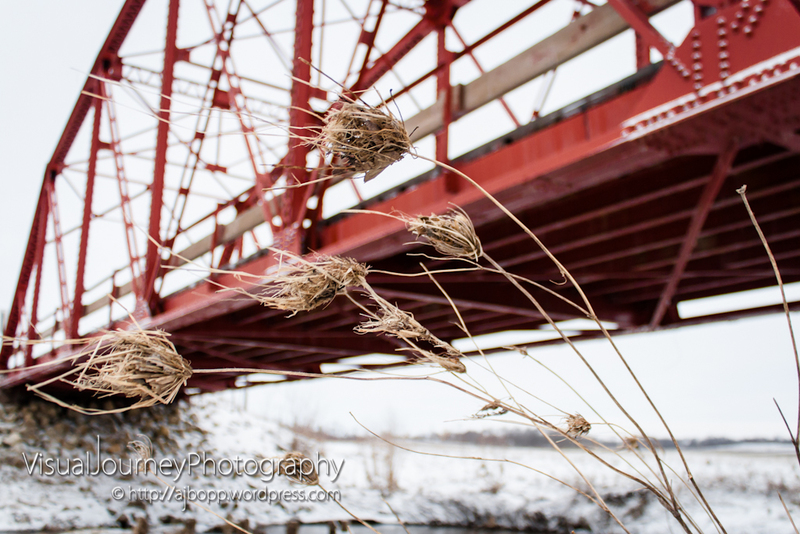 Haha it may still feel like winter but I think you did a really good job at capturing the color of the bridge while keeping the subject in focus! I know the feeling. I do like the composition. If I were you I’d rework it for next wednesday with the snapseed grunge filter and b/w conversion. Thanks Nels. I may try that eventually. I try to keep my reworks to older stuff. It may be interesting to see what some of the Snapseed filters can do with this image. But I like this. the motion of the seed heads with the strong red structure in the background. Beautiful Image and really like the composition. Marcus and I have also been feeling the same way due to the uncooperative weather we have had at least through March. Things are starting to look up though weatherwise and I hope things change soon for you too!